The all-new RAM 1500 is packed with power. However, utilizing all that power can put drivers in dangerous situations. 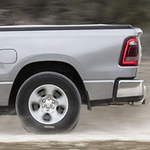 But, you don't have to worry in the RAM 1500, because it doesn't skimp on safety. In fact, it includes over 100 available and standard safety features for peace of mind. We all know a truck is often used for towing. So, a RAM 1500 has blind spot monitoring with rear cross path detection, which automatically considers the length of your trailer. There's also available parallel and perpendicular park assist which automatically controls your steering and guides your braking and accelerating. The RAM 1500 also helps you keep an eye on your surroundings. The 360° Surround View Camera lets you see everything around you. Plus, the lane-sense departure warning plus not only warns you when you are drifting out of your lane, but safely guides you back into the appropriate position.